For some, it is a time to rest the stars and let the kids go out and play, as was the case for the Atlanta Hawks last night. Yet more often than not, the final week of the regular season is a time for those who haven’t reached the holy grail of the NBA Playoffs to feature what could be the very near future for their organization. Thus was the case for the Portland Trail Blazers who, in a 93-77 loss Tuesday night to the Los Angeles Clippers, featured four rookies in their starting line-up, as well as another off the bench. The Trail Blazers –who were eliminated from playoff contention just a few short weeks ago –already feature the top point guard of the 2012 NBA Draft Class in Damian Lillard, and showed that they care very much about the focus of all their young athletes. Meyers Leonard and Will Barton, two products of Portland’s 2012 Draft, and two former Portland draftees who are finally getting their due (Victor Claver, the 22nd overall pick in 2006, and Joel Freeland, the 30th overall pick in 2009) all received huge minutes in last night’s game. While Lillard, a frontrunner for Rookie of the Year, has been the most consistent and impressive, Barton has been extremely impressive as of late, scoring in double figures in four of his last five games (16.3 ppg). He shot 8-of-14 against the Clips for 17 points, and contributed in a variety of ways with 6 rebounds, 5 assists, and 3 steals.Lillard, Leonard, and Barton may receive more minutes down the road, but for one night, it was a pleasant surprise to see Portland’s youth movement in full swing. In the only other NBA game of the night, Toronto and Atlanta also showed off their rookies, with all five (collectively) getting plenty of playing time. Toronto’s impressive Lithuanian Jonas Valanciunas led the way with 13 points on 4-of-5 shooting, 8 rebounds and 3 blocks. Toronto’s other rookies Quincy Acy and slam-dunk champion Terrence Ross combined for 13 points, 9 rebounds, 3 steals and 1 block in a total of 40 minutes. While the numbers weren’t jaw-dropping or a difference maker (Toronto handedly defeated the Hawks 113-96), it was impressive to see that the two have embraced Dwayne Casey’s defensive mindset, as it will continue to get them minutes in the future. 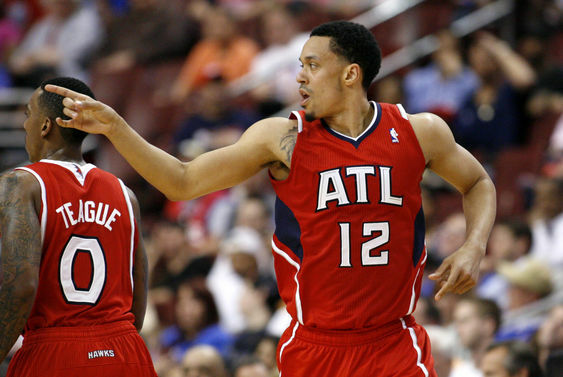 On the Atlanta side of the ball, however, the Hawks’ rooks struggled to get much going offensively. John Jenkins, the sharp-shooting 22nd overall pick out of Vanderbilt, and Mike Scott, the powerful second round pick from Virginia, shot a combined 7-of-25 from the field. While Scott finished the game with a double-double (12 points, 12 rebounds), Jenkins failed to get anything going, as he went 0-of-6 from downtown and was ideally a nonfactor elsewhere on the court. While Scott further solidified his chances to be Atlanta’s second big off the bench in the playoffs, Jenkins’ poor performance will raise doubts as to whether he will receive many minutes in the postseason. Jenkins has recently strung together some strong shooting performances (shooting 17-of-26 from the field in his last three games), but this outing showed that Jenkins needs to recognize when he’s hot and when he’s not. The Hawks, Raptors, and Trail Blazers will all wrap-up the regular season tonight against the New York Knicks, Boston Celtics, and Golden State Warriors respectively. It will give each of these rookies one last chance to show how much they’ve grown before a well-deserved off-season or first playoff appearance. Regardless of how well or poorly their first season has gone, these rookies will soon be moving on to bigger, better, and brighter futures; ones that include a better knowledge of the game, and a few less childish backpacks. Also, don’t forget to follow us on Facebook and Twitter! This entry was posted in Rookie Recap and tagged 2012 NBA Draft, Atlanta Hawks, Damian Lillard, John Jenkins, Jonas Valanciunas, Josh Freeland, Meyers Leonard, Mike Scott, NBA, NBA Draft, NBA Playoffs, NBA rookies, Portland Trail Blazers, Quincy Acy, Terrence Ross, Toronto Raptors, Victor Claver, Will Barton by NBA Rookie Class. Bookmark the permalink.